In which case yes using the Vigor 130 as modem and your router is fine. Some of the Vodafone backhaul links are clearly overloaded. If you find that happens, it could be prudent to take advantage of the option to cancel the contract in the first month without having to pay an early termination charge. I'm on one of these links which is overloaded, but not enough for VF to upgrade it. I went though an interesting conversation with one of their customer service guys, and he basically told me the best bet was a leave and use another provider. They would even pay my migration fees. However, I opted for an upgrade to the upto 78service, which seems to work significantly better than the upto 38. The CS guy said you should be able to ask your proposed new broadband supplier if they are experiencing backhaul link issues before signing up.... I keep meaning to pop into the Vodafone shop in town and ask them. I am surprised that you got a better speed in that situation after the upgrade. Fortunately so far I have not suffered from poor back haul. I have the 38Mbps product. My max connection speed is about 48Mbps. I was able to watch Netflix 4K without any problem. 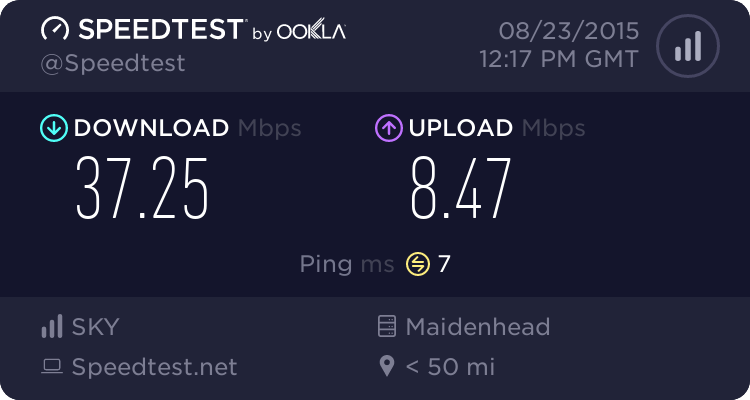 It is was strange, but I work from home during the day where the backhaul is generally fine, so the added upload speed was a bonus. It almost seems that being on a the faster product you get twice as much of the backhaul capacity cf a upto 38 customer, so when it is at capacity the faster customers still get more throughput than the slower ones. Here is an example of Vodafone in the evening.... See the really poor single thread test, which then seems to abort. I use the Netgear DM200 as a modem, £35 works well and gives a slightly higher speed than the Vodafone router. I've only been live for a week, but can confirm that the Vodafone router syncs lower than a 3rd party one. The Vodafone CS guys would only give me the password and username if I could give them a Openreach approved router/modem model number. So just make sure you have the list to hand if the Draytek isn't on the approved list.